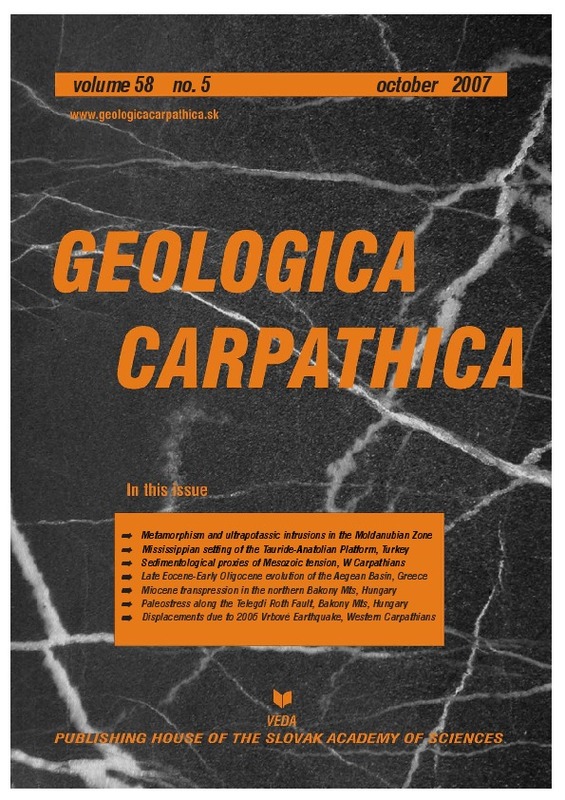 Abstract: From the Late Eocene to Early Oligocene (NP18–NP21), submarine fan deposits and shelf deposits were accumulated on Lemnos Island, Greece. These sediments, with shelf deposits overlying the submarine fans, were deposited in a broad basin, which, in this time interval was gradually restricted in space. Colour, texture, thickness, grain size and sedimentary structures were used for the detailed sedimentological analysis of the turbidite deposits, in order to identify the sub-environments and the processes which control the growth of the submarine fan. This analysis demonstrates the classification of the sediments as a sand-rich submarine fan, which was constructed under the simultaneous interaction of progradation and aggradation and shows a main paleocurrent direction from SSW to NNE. The flow types that control the depositional processes of the submarine fans were grain flows, debris flows and low, medium- and high-density turbidity currents. The evolution of depositional environments outlined above indicates a progressive relative sea-level fall, and in relation to the lowstand conditions, during this time space (NP18–NP21), with no significant sea-level fluctuations, it could establish a theory that the studied area was mostly influenced by regional tectonic activity and less by eustatic sea-level changes.